Zombies are the stuff of nightmares, books, movies and television shows. Try as we may, it's almost impossible to kill them -- the zombies, that is. The idea that humans can be transformed into mindless, cannibalistic monsters isn't so far-fetched, according to current research in which scientists have discovered pathogens that can turn even insects into the walking dead. "We may already be in the midst of a growing zombie apocalypse. What is a zombie? A zombie is a creature that's controlled outside of its own mind and really not controlled by itself, as if under the power of some other force," Morgan Freeman, host of Science Channel's "Through the Wormhole" series, told The Huffington Post. The latest episode of "Wormhole" examines how new strains of viruses attack humans every day and explores the odds against surviving a zombie virus outbreak. Medical consequences aside, Freeman told HuffPost why he thinks we're so fascinated with the idea of the walking dead. "I think, basically, it all stems from our desire for immortality -- the idea that there is some way to come back from the grave," he said. Even the smallest of creatures -- ants, for example -- can transform into zombies, according to current research discussed on "Wormhole." "There's a fungus that takes over the brain of an ant and forces it to do things it wouldn't ever want to do -- like climb to the top of a tree and clamp onto a leaf with its jaw, where it dies, and then the fungus grows out of its head and rains spores down onto its family," said "Wormhole" supervising producer Megan Parlen. HuffPost asked Freeman if he thinks the international fixation on zombies might have anything to do with the nightmares we all share. "There is no way to say no to that," Freeman said. "You may have nailed it right there. It just might be right out of someone's nightmare, but then once scientists get their teeth into something like that, they'll go out and find out if there's any truth in it somewhere. "I go back to this whole thing of immortality, that the dead are not really dead, that they exist somewhere, maybe in our nightmares." The "Wormhole" series asks whether we would know it if we're already experiencing a zombie apocalypse. "Well, we'd have to define 'zombie' for ourselves first," Freeman noted. "I mean, what exactly is the definition of a zombie? Is it something that is undead and not in control? If that's true, then we're in the middle of an apocalypse right now. Because everybody is controlled by something else. Your smartphone is in control of you and computers are in control of all of us." Freeman suggests that a zombie pandemic could emerge from something as simple as a virus. "Yes, it's much more realistic to think that the possibility lies within a virus somewhere, and it could happen," he said. "I think one of the main consequences would be that we'd have these large detention camps for people who exhibited symptoms. And let's not forget the whole survival thing -- that one emotion or drive will make you do whatever you have to in order for you to keep moving, for you to stay alive." 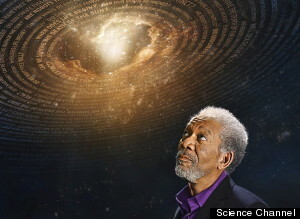 "Through the Wormhole With Morgan Freeman" airs Wednesdays on Science Channel at 10 p.m. Check your local listings for more information. It's just a matter of time before the undead rise up and take over the planet, here are 10 tips to surviving a zombie apocalypse.